McBASTARD'S MAUSOLEUM: 88 Films Pays Tribute to the Late Great Umberto Lenzi with a Mega-Edition of his All-Time Terror Classic EYEBALL (1975)! 88 Films Pays Tribute to the Late Great Umberto Lenzi with a Mega-Edition of his All-Time Terror Classic EYEBALL (1975)! 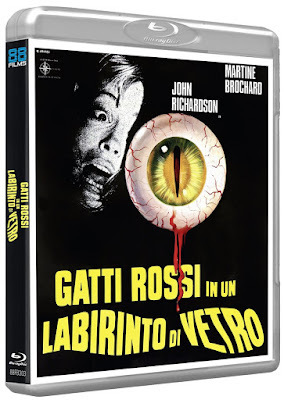 On general release from August 27th but shipping from the 88 Films website SOON is one of the grand guignol greats of giallo horror! Long since regarded as an underrated name among the top tier Italian terror directors, Umberto Lenzi sadly left us just one year ago. 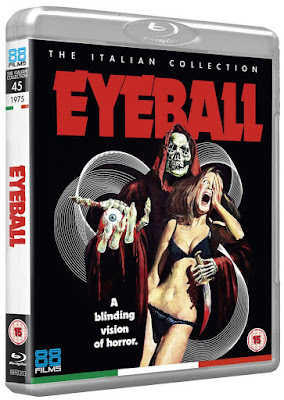 As such, we at 88 Films have been preparing the ultimate edition of what is widely regarded as his most mesmerising horror hit – the 1975 stalk ‘n’ slash shocker EYEBALL! In this eerie bout of blood-splashed brilliance, a tour bus visiting some especially scenic Spanish resorts encounters a series of gruesome goings-on when one-by-one various tourists begin to lose their peepers to a red-gloved (yes, not a black-gloved!) slaughterer. It is difficult to predict how this rollercoaster ride of knife-play plasma-spilling fear will conclude but one thing is for sure… no one has seen EYEBALL looking better than in this amazing new 2k scan which comes as a packed (and we mean PACKED) limited special edition. 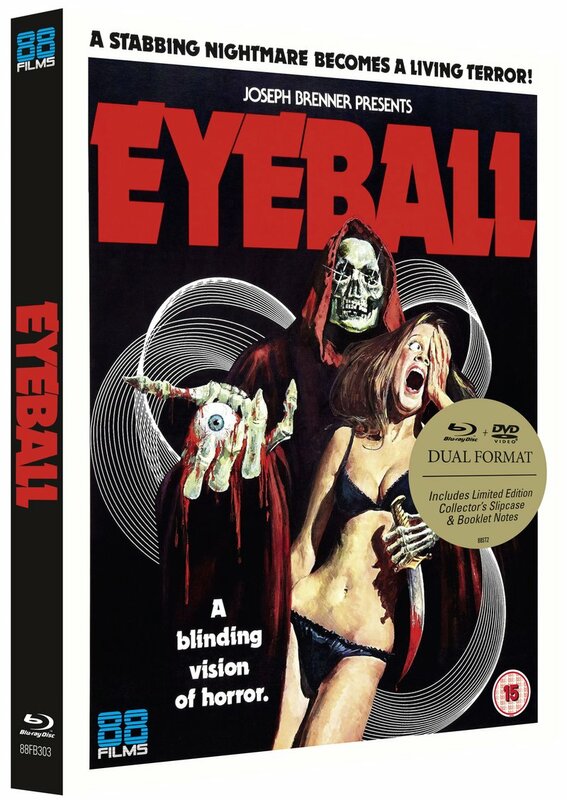 Never before seen in the UK, this spectacular 88 Films debut of EYEBALL will surely, finally, give Lenzi his standing as one of the finest fright-makers to ever step on a sanguine-caked movie set. 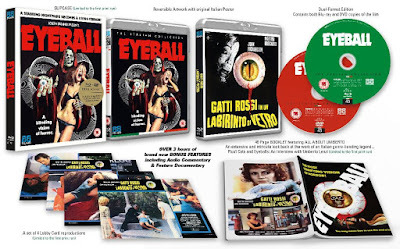 Priced at the frankly astonishing bargain price of £15.99, EYEBALL is available for pre-order from 88 Films NOW and comes accompanied by a new 85 minute long documentary, ALL EYES ON LENZI: THE LIFE AND TIMES OF THE ITALIAN EXPLOITATION TITAN – which contains not just unseen Lenzi interview footage and an entire breakdown of the late, great exploitation-helmer’s phenomenal celluloid musings but is an official selection of the SITGES INTERNATIONAL FILM FESTIVAL 2018! In addition, this outrageously enthusiastic package includes and additional chat with the actress Martine Brochard whose credits include the likes of THE VIOLENT PROFESSIONALS and many other greats of the Rome-based gore-game. As well as original trailers and an audio commentary from Justin Kerswell and the Hysteria Continues team, fans can look forward to an extensive booklet that charts and horror highs and bullet-ridden police ballets of the one and only Umberto Lenzi! - ALL EYES ON LENZI: THE LIFE AND TIMES OF THE ITALIAN EXPLOITATION TITAN - Brand new feature length documentary (80 minutes) detailing the work and legacy of Rome’s most prolific grindhouse nightmare-maker. Features never-before-seen interview footage with Lenzi himself and comments from critics John Martin, Manlio Gomarasca and Rachael Nisbet, academics Calum Waddell and Mikel Koven, actors Danilo Mattei and Giovanni Lombardo Radice and director and writer Scooter McCrae! !